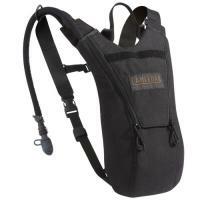 The CamelBak Stealth is a low-profile and highly portable hydration backpack. It is made from all-black Cordura, giving it high strength and durability and allowing it to blend into dark surroundings. Its comfortable shoulder and sternum straps come with a hook and loop strap management system for storage, and the back panel is ventilated for improved breathability. Closed cell ventilation around the hydration pouch keeps your water cool and fresh for longer, wile the neoprene tube cover insulates it all the way to your mouth. The bag contains a mil-spec Antidote reservoir with a 70 ounce capacity. Its large fillport opens and closes with just a quarter turn for convenient refilling, and provides a watertight seal that cannot be overtightened.